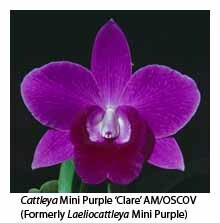 Do you grow Laeliocattleya Mini Purple, Sophrolaeliocattleya Hazel Boyd or Sophrolaelia Jinn? Not any more, I’m afraid. Look them up on the Royal Horticultural Society web site (www.rhs.org.uk/research/registration_orchids.asp) and you’ll find that they have dis­appeared! Actually they’re still there but listed elsewhere under new names, which can be difficult to find. What has happened to Laeliocattleya (Lc.) Mini Purple, which was originally registered (in 1965) as the hybrid between Laelia pumila and Cattleya walkeriana? Well, a few years ago Laelia pumila, as well as all the other Brazilian “laelia” species, were transferred to the genus Sophronitis because DNA studies showed that they were much more closely related to existing sophronitis species than to those laelia species from Mexico. The above hybrid is therefore no longer a laeliocattleya but has become a sophrocattleya, to be known henceforth as Sophrocattleya (Sc.) Mini Purple. The same change applies to all other hybrids between cattleyas and Brazilian ‘laelias’. Before you race out to change all your labels from Lc. to Sc., I should stress that not all laelia species have been transferred to the genus Sophronitis – only those from Brazil! Those laelias native to Mexico remain as such and therefore the hybrid between Laelia anceps (a Mexican species) and Sophronitis coccinea retains its original name, namely, Laeliocattleya Camargo. Other name changes have been made to accommodate the new genus Guarianthe, to which several “cattleya” species from Central America have been moved on the basis of other DNA studies. Cattleya bowringiana is now Guarianthe bowringiana, while the former Cattleya aurantiaca and Cattleya skinneri are now Guarianthe aurantiaca and Guarianthe skinneri, respectively. 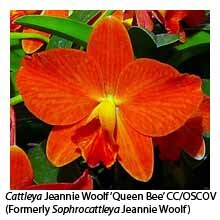 Intergeneric hybrids between Cattleya and Guarianthe have been given the new genus name Cattlianthe. As a consequence the old Cattleya Bactia becomes Cattlianthe Bactia (Guarianthe bowringiana x Cattleya guttata). 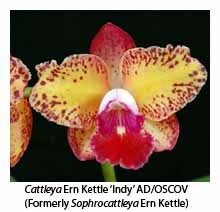 So, what has happened to our old friend Sophrolaeliocattleya (Sic) Hazel Boyd? It’s now listed as Guarisophleya Hazel Boyd, which may be a little shorter to type but certainly no easier to pronounce or remember! Similarly, Sic. Jewel Box has become Guarisophleya Jewel Box. Both are hybrids between species (or hybrids) containing Guarianthe, Sophronitis and Cattleya. A few other favourites with new names are Sophranthe Chit Chat (formerly Lc. Chit Chat), Sophranthe Trick or Treat (Lc. Trick or Treat) and Sophranthe Amaroo (Lc. Amaroo). What about that colourful hybrid made from Laelia milleri and Sophronitis coccinea, and long known as Sophrolaelia (SI.) Jinn? The bright red Brazilian species, Laelia milleri, is now known as Sophronitis milleri, and consequently SI. Jinn becomes Sophronitis Jinn.